Soya flour is made by grinding roasted soybeans into a powder. Soya bean flour is considered a health food, and is used in many food products. With increasing awareness about health, there is a distinct shift towards soya products including its flour. Its use as a supplement to wheat flour is increasing substantially in many households. Rich in high-quality protein and other nutrients, soy flour also adds a pleasant texture and flavour to foods. • Natural or full-fat soy flour, which contains the natural oils that are found in the soybean. • Defatted soy flour, which has the oils removed during processing. Both kinds of soy flour will give a protein boost to recipes; however, defatted soy flour is even more concentrated in protein than full-fat soy flour. • Soya flour is nowadays commonly available in all grocery stores. • Soya bean has an anti-nutritional factor that causes poor digestibility of protein. It is therefore better to buy readymade flour as it has all anti-nutritional factors removed. Likewise, if you want to use with wheat flour, mix readymade soya flour with wheat flour, rather than mix soybeans and wheat and grind in a mill. • Read the package before buying, to check the packed and use-by dates. • Stir the soya flour once before measuring out for any recipe, as it sometimes gets caked. 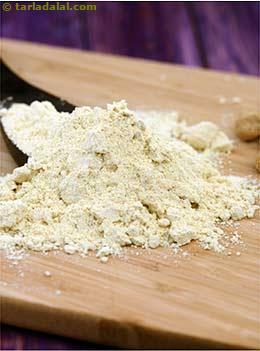 • Soya flour can be used as-is, or, for a pleasant nutty flavour, it can be toasted slightly before adding to a recipe. To do this, put the soy flour in a dry skillet and cook it, stirring occasionally, over moderate heat. • Soya flour can be used coarsely powdered as a thickening agent in gravies and sauces, or it can be added, finely powdered, to baked goods. • It is used extensively to make fudge and other candies, pies, doughnuts, cakes and rolls, pasta, pancake mixes and frozen desserts. • In baked products, soya adds tenderness and moisture and helps to keep products from becoming stale. • Products containing soya flour brown more quickly, so it is sometimes necessary to either shorten the baking time or decrease the temperature slightly tadalafil over the counter. • For products that do not contain yeast, such as muffins and cookies, replace up to a quarter of the total amount of flour called for in a recipe with soya flour. For products that are yeast-raised, such as bread, replace up to 15 per cent of the flour called for in the recipe by placing two tablespoons of soya flour in the cup before measuring each cup of flour. Using more soya flour than this will cause breads to be too heavy and dense, since soya flour is free of gluten, the protein that gives structure to yeast-raised baked products. • Soya flour also makes a good egg substitute in baked products. Replace one egg with 1 tablespoon of soya flour plus 1 tablespoon (15ml) of water. • In fried foods, like doughnuts, soy flour reduces the amount of fat that is absorbed by the dough. • Soy flourWatch movie online Rings (2017) can also be used to make a quick, homemade soymilk. • Because soya flour must always be refrigerated, it is not often available in bulk. • Keep soya flour in the refrigerator for several months or in the freezer for up to a year. • Soya flour is rich in vitamins, minerals, isoflavones and lecithin, nutrients proven to help lower cholesterol, prevent cancer and loss of bone mass. • Soya is strongly recommended for diabetics, expectant mothers, growing children, cardiac patients, weight-watchers and the aged. • A 100 per cent vegetarian high quality protein source that does wonders for young and old. • Especially great for growing children, as it provides critical vitamins, minerals, fibre and protein. • Eating more high-fiber foods like fruits, vegetables, whole grains and soya nuggets helps to lose weight. • Soya is one of the best non-fish sources of essential omega-3 fatty acids, which may help reduce the risk of coronary heart disease. • Soy protein may provide positive results for people with high blood pressure. • Soy protein is beneficial to women in post-menopausal years. • Soya is low in fat and sodium, and may help reduce the risk of heart disease.